As I was sitting in bed trying to make the best of being sick, Twitter crashed. It went out of service for quite time time. Of course, most people immediately went to other Social Media areas. While in one of those locations Kelby, TypaAMom, mentioned that she wished the Fail Whale was a little more festive. I immediately went to Picnik and had some holiday fun. I wanted to at least make her smile. Of course, TechyDad added that it would be fun to change some of the Twitter birds to dreidels, so here is what I came up with just for him. 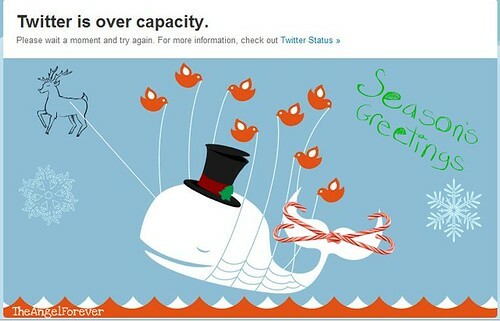 Now we can just hope that the Fail Whale behaves as we head into the New Year. As fun as holiday inspired themes are, I would prefer not to make another.